Bottom-trawling fisheries are a common threat to the health of continental margins worldwide. Together with numerous environmental and biological processes, physical disturbance induced by trawlers can largely shape the benthic habitats and their associated assemblages. At the SW Portuguese Margin, crustacean bottom trawlers have exploited deep-sea habitats for a few decades, but its effects on the benthic biodiversity are practically unknown. During the spring-summer of 2013 and 2014, several Remotely Operated Vehicle (ROV) video transects were used to investigate mega-epibenthic abundance, composition, and diversity in soft-sediment areas subjected to varying trawling pressures off Sines and Setúbal (200–800 m). Differences in mega-epibenthic assemblages were linked with environmental changes (depth, grain size, primary productivity) and trawling disturbance. The effect of trawling was assessed between segments with similar habitat characteristics, i.e., muddy-sand bottoms between 300 and 500 m. Areas subjected to intensive trawling pressure showed a generally flattened seabed, with abundant recent trawl marks (up to 3 scars.100 m−1), indicating that the seabed physical integrity was compromised. Significant negative correlations were detected between various mega-epibenthic diversity indices [S, H′, and ET(20)] and trawling pressure (h.cell−1.y−1). Furthermore, the distinct mega-epibenthic assemblages and absence of several sessile erect morphospecies at both low and highly disturbed locations by trawling off Sines, namely all seapen morphospecies found in non-trawled areas, demonstrates the negative influence of trawling fisheries on the benthic component of the study area. Also, low dissimilarity between assemblages from the main fishing grounds and the adjacent low-disturbance locations, suggests that the potentially negative influence of trawling can extend beyond the targeted areas (e.g., by the plumes of re-suspended sediments). The observed deleterious effects of trawling on mega-epibenthic fauna together with the intensification of trawling pressure in the study area, stress the need for adequate monitoring programs and regulatory measures to halt the long-term loss of biodiversity and allow the sustainability of fisheries at the SW Portuguese Margin. Continental margins are considered productive and diverse regions in the deep sea (Levin and Dayton, 2009). They encompass several unique habitats, such as submarine canyons, seamounts, and even chemosynthesis-based habitats (e.g., pockmarks and mud volcanoes). Hence, benthic faunal biodiversity at margins is complex as it is shaped by the interaction of numerous environmental and biological processes (e.g., substrate sorting, water-mass properties, productivity regimes, predation, competition), but also to some extent, by the increasing pressure from anthropogenic activities (e.g., fisheries, pollution, mineral, and oil extraction; Levin et al., 2001; Levin and Dayton, 2009; Ramírez-Llodra et al., 2011). Among the several anthropogenic activities occurring in deep waters worldwide, bottom-trawling fisheries are identified as one of the most destructive, affecting primarily the continental shelf and upper slope, seamounts, and submarine canyons (Ramírez-Llodra et al., 2011). General impacts caused by trawling practices are relatively well-established for the shelf areas, although the magnitude and duration of the effects largely depends on the characteristics of the targeted habitats, gears used, and trawl intensity and frequency (Jennings and Kaiser, 1998; NRC, 2002). Moreover, the low selectivity of trawling practices directly causes a high mortality of both target and non-target species and alterations or destruction of seabed habitats (NRC, 2002). Indirectly, trawling also promotes shifts in benthic community composition and diversity, while trophic webs may also be affected, namely by the increase in carrion available from both on-site mortality and discard practices (NRC, 2002). Also, effects of trawling are highly dependent on the faunal size-groups, as a greater vulnerability is linked with the large-sized fauna (macro and megafauna; Jennings et al., 2001; Duplisea et al., 2002). In this context, megafaunal organisms, defined by Grassle et al. (1975) as animals >1 cm either easily detected in photographs/videos or collected by trawl nets, are particularly sensitive to repeated trawling disturbance. Subsequently, changes in megafauna assemblages can result in depletion of several ecosystem functions, since megafauna is known to promote important benthic-pelagic coupling processes (Soltwedel et al., 2009), and function as “ecosystem engineers.” For example, mega-epibenthic organisms can promote habitat complexity and induce changes in the sediment biogeochemistry via bioturbation, but also by serving as biogenic habitats for smaller fauna (e.g., corals; Buhl-Mortensen et al., 2010). It is postulated that trawling practices may have stronger effects on the deep-sea mega-epibenthic fauna in comparison with shallower areas (Clark et al., 2015). This arises from the typical characteristics of deep-sea species, particular life-history traits (k-selected; e.g., slow growth, high longevity), metabolic rates (low productivity) and reproductive strategies (e.g., intermittent spawning events), which make them more vulnerable and less resilient to the effects of trawling practices (Thrush and Dayton, 2002). Heavier trawl gears and more localized practices can also exert a stronger pressure on deep-sea habitats (Clark et al., 2015). Yet, the effects on deep-sea benthic habitats and mega-epibenthic assemblages are still debated and geographically dependent, since in most cases we lack either background knowledge of the biodiversity on the long-term targeted areas, or an obligatory legislation that requires impact assessment and monitoring programmes at recent fishing grounds (Clark et al., 2015). The most obvious effects identified so far include the large-scale changes of the seabed topography and sediment dynamics (e.g., fishing grounds at the upper flank of La Fonera canyon, Catalan margin; Puig et al., 2012). With each trawling haul, the seafloor is flattened and large amounts of sediment are re-suspended, often resulting in alterations of both surface and sub-surface sediment properties, namely organic matter concentrations, grain size composition, and porosity (Martín et al., 2014; Oberle et al., 2016). These high turbidity periods often extend beyond the fishing grounds, indirectly impacting non-target areas by smothering filter-feeding organisms and increasing mortality rates of their faunal assemblages (Greathead et al., 2007; Leys, 2013; Clark et al., 2015). Effects on mega-epibenthic fauna include the decline of both standing stocks (abundance and biomass) and species richness, and changes in community composition (Clark et al., 2015 and references therein). In addition, the damage of long lived habitat-forming organisms (i.e., sponges and corals) in seamounts areas, have shown a very low recoverability and marked community shifts of their associated fauna (Koslow et al., 2001; Clark and Rowden, 2009; Williams et al., 2010; Yesson et al., 2016). In more extreme cases, alterations of the mega-epibenthic faunal distribution patterns at different spatial scales can also occur (Althaus et al., 2009). It is important to stress that current knowledge pertains mostly to rather charismatic and vulnerable hard substrate habitats such as cold-water coral areas and seamounts (Clark et al., 2015 and references therein). Less focus has been directed to study the effects of bottom trawling on fauna inhabiting soft sediments from slopes and canyons along continental margins worldwide (e.g., Atkinson et al., 2011; Buhl-Mortensen et al., 2015; Murillo et al., 2016; Yesson et al., 2016). Yet, some indications arise regarding their potential for a faster recovery after disturbance (Yesson et al., 2016). Hence, it is crucial to increase our knowledge related to trawling effects at these areas that naturally contrast from hard-bottom areas, so we can adequately adjust the current management actions to allow for a sustainable exploitation of natural resources, and maintain a good environmental status. The Iberian Margin has been identified as one of the most disturbed regions by bottom-trawling fisheries in Europe. This activity affects 40–90% (depending on the substrate type) of the areas beyond the six nautical miles limit down to ca. 1,000 m water depths and is associated with a large footprint per unit of landing with ca. 13–17 km−2t−1 depending on the depth range considered (Eigaard et al., 2016; Bueno-Pardo et al., 2017). Moreover, few studies have attempted to understand the trawling impacts on the benthic assemblages and are limited by the absence of adequate control areas (Morais et al., 2007; Fonseca et al., 2014). The present study aims to address this issue by investigate the upper slope mega-epibenthic assemblages in a southwest Iberian margin area subjected to long-term crustacean bottom trawling. Specifically, we hypothesized that (i) the spatial and temporal environmental heterogeneity in the study region (i.e., water depth, sediment composition, annual productivity) will affect mega-epibenthic composition and community structure; (ii) Changes in the mega-epibenthic abundance, diversity, composition, and community structure are altered by different degrees of bottom-trawling pressure (including no-, low-and high trawling pressure). These hypotheses will be tested using multivariate analyses. The West Iberian Margin (WIM) is characterized by a relatively narrow shelf with a steep and irregular continental slope, incised by several large submarine canyons. It is exposed to complex seasonal hydrodynamic processes, driven by wind forcing, local bathymetry, and prominent topographic features, such as the Setúbal canyon (Fiúza, 1983; Relvas et al., 2007). During spring and summer, northerly winds induce relatively weak upwelling regimes, reaching a maximum off cape of Sines (SW Portugal). The inverse tends to occur during winter, with downwelling regimes and strong storm events, driven by south-westerly winds, although pulse episodes can occur at all seasons (Fiúza, 1983; Relvas et al., 2007). The high surface primary production generated during upwelling extends often for ca. 30–40 km offshore, but in some areas phytoplankton bloom filaments can reach as far as 200 km offshore. The relevant contribution of the surface productivity peaks to total standing stock and primary production have a significant impact on the food webs, supporting productive fisheries along the WIM (Picado et al., 2014). Fishing activities along the WIM comprise various métiers, of which deep-water otter trawling, often designated as “crustacean bottom trawling,” as one of the most economically important, accounting for more than 30% of the total landing sale values (Campos et al., 2007). Crustacean trawling fisheries at the WIM are typically restricted to the South and Southwest regions off Portugal, where the most landed and valuable species include several deep-water crustaceans species, such as the Norway lobster (Nephrops norvegicus), red and rose shrimps (Aristeus antennatus and Parapenaeus longirostris, respectively), but also a few demersal fish species such as blue whiting (Micromesistius poutassou) and the European hake (Merluccius merluccius; Campos et al., 2007; Bueno-Pardo et al., 2017). In 2014, the total declared landings of these species altogether for the SW Portuguese region were relatively low (ca. 50 t y−1, and about 5% of the total landings). Yet, this region yielded ~30% of the total trawling effort in Portugal (Bueno-Pardo et al., 2017). While not all of these species show the same habitat preferences, their distribution often overlaps at the soft sediment areas (mud and muddy-sand) between 200 and 800 m water depths (Monteiro et al., 2001). Fishing grounds along the Portuguese margin are delimited by legal restrictions defined by the initial official regulation from July in 19871, which prohibits trawling within six nautical miles from the coastline. Based on the vessel monitoring system (VMS) satellite data compiled by DGRM (MAMAOT, 2012), a region of interest in the SW Portuguese margin was delimited at ~37°40′-38°20′N; 08°50′-09°20′W, along the upper continental slope (200–800 m water depth) off Sines and in the vicinity of Setúbal canyon (Figure 1A, Table 1). Here, two main seabed types can be identified considering the habitats scheme of the European Union Nature Information System (EUNIS; Davies et al., 2004) and detailed sediment charts from Instituto Hidrográfico (2005a,b): coarser sediments (A6.3: deep-sea sand) at shallower depths (ca. 200–300 m) until the self-break/upper slope transitions areas, while finer sediment types occur at deeper locations (>300 m; A6.4: deep-sea muddy-sand, with variable mud, and carbonate contents). Owing to the occurrence of the Norway lobster habitat (fine sediments near the shelf break) and proximity to Sines harbor, this region is heavily targeted by crustacean trawlers. On the other hand, the 6 nm limit creates a trawling-free area between cape Sines and cape Espichel (Setúbal area), allowing the comparison between heavily fished and non-fished areas at similar depths and sediment types (Figure 1A). Figure 1. (A) Map of the study area indicating the locations of ROV dive transects in relation to the distribution of the crustacean trawlers annual trawling pressure (h.cell−1.y−1) for (B) 2013 and (C) 2014. Setúbal canyon area is not shown (0 h.cell−1.y−1). Table 1. Metadata on ROV dive transects. A total of six ROV survey transects were performed. The surveys were designed taking into consideration the available information from the VMS satellite data and the known distribution of sediment types. In 2013 (RV Belgica, cruise 2013/17), two transects (6,000 and 11,500 m; D13_1 and D13_3, respectively) were outlined perpendicularly to the coastline from the upper continental slope to shallower areas. These covered several types of sediments (sand to muddy sand) and crossed a gradient of trawling pressures, including heavily fished deeper areas and the transition to less or no fished shallower areas (Figure 1B). In 2014 (RV Pelagia, cruise 64PE387), four shorter transects (<4,000 m) were delineated only in areas of similar sediment type (muddy sand). Two transects running parallel to the coastline focused on trawling target and adjacent non-target areas (D14_3 and D14_4; respectively Figure 1C) in the main fishing ground off Sines. 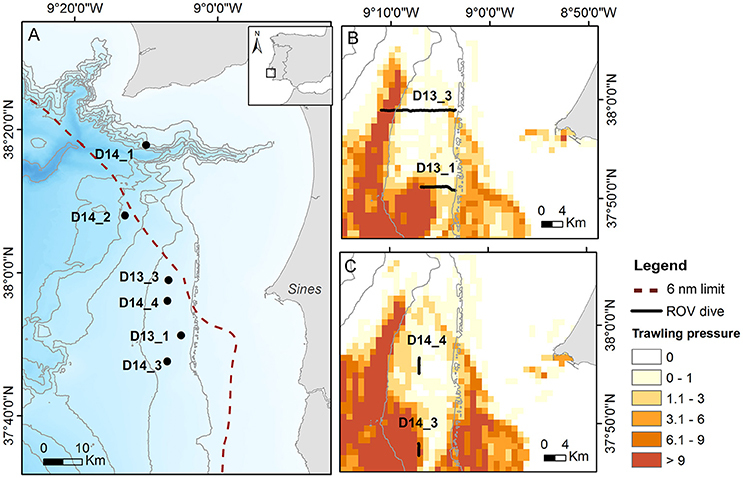 Additionally, two other transects (D14_1 and D14_2, Figure 1A), were initiated near the flanks of the Setúbal canyon, where trawling pressure is null, and in the case of D14_1, it was located within the 6 nm limit. Both dives were not fully completed as planned (longer transects) owing to safety reasons, due to the risk of entanglement in the numerous fishing traps deployed at depths of ca. 450 m.
The video transects were performed using the ROV Genesis, a sub-Atlantic Cherokee-type Remotely Operated Vehicle from VLIZ (Vlaams Instituut voor de Zee). Each video recording was obtained using two forward-looking standard definition black and white (Kongsberg OE15–100a) and color cameras (Kongsberg OE14–366/367) at a speed of ~0.4 m.s−1 and altitude of ~1 m above the seabed. In addition, digital still images were acquired at ~30-s intervals using a high definition camera (Canon PowerShot G5). Accurate geo-positioning of both video and stills was obtained though the IXSEA global acoustic positioning system. Video recordings were analyzed in segments of 100 m (linear distance sampling unit) calculated from the geo-positioning data. At each segment, all specimens visible in the footage were counted and identified to the lowest taxonomic level possible using additional high-resolution stills taken during the dives. Some of the species captured digitally could be confirmed by the identified specimens collected for macrofauna studies within the same sampling campaigns. In many cases, it was not possible to accurately assign specimens to species level and they were thus grouped into separate morphospecies, based on distinct morphological characteristics. Taxonomic classification followed the World Register of Marine Species database (WoRMS Editorial Board, 2016; www.marinespecies.org). Typical pelagic organisms (Ctenophora, Scyphozoa, and pelagic fishes) were also identified but not counted, since these organisms sometimes followed the ROV lights for long distances, not allowing their accurate quantification. Note that demersal fish species were included in our analysis, due to their direct interaction with the seabed. Video observations also included the description of seabed characteristics (e.g., bioturbation evidence, topography, ripple marks, phytodetritus patches) and any evidence of disturbance by trawling operations (trawl scars). Trawl scars were classified into “eroded”—scars where evident bioturbation and/or collapsed tracks; and “recent”—scars that were clearly undisturbed by bottom currents or faunal activity. Due to technical issues, the reference scale normally provided by the laser points was not available and consequently the field view area was not estimated, which hindered biomass estimates and estimates of abundance per area (thus expressed per 100 m). The segments were performed at a relatively constant camera position and altitude, allowing the comparison among dives in both years. When this was not possible (e.g., no visual contact or varying altitude, high sediment resuspension, strong illumination), segments of “poor image quality” were excluded from the analysis to avoid low confidence level observations, resulting in the analysis of ~65% of the video recordings (Table 1). Geographical information system software ArcGIS v10.3.1 was used to compile environmental data pertaining to each segment obtained from various sources as mentioned below. Annual trawling pressure estimates (h.cell−1.y−1; where each cell size corresponds to 0.01 × 0.01 decimal degrees) were used as a proxy for the intensity of disturbance caused by crustacean trawlers to the seabed during the 2 years of this study. Trawling pressure was calculated based on VMS position data of the deep-water otter trawlers in operation along the Portuguese Margin, often designated as “crustacean trawlers.” This data was provided by DGRM and processed according to Bueno-Pardo et al. (2017). 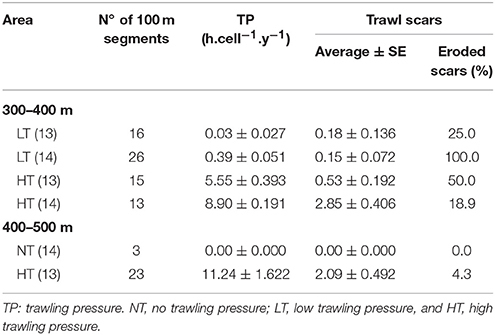 Trawling pressure data allowed to classify each segment into one of the following classes: no (NT: 0 h.cell−1.y−1), low (LT: 0.1–1.5 h.cell−1.y−1), and high (HT: >1.5 h.cell−1.y−1) trawling pressure. In fact, both NT and LT locations are assumed to be not directly disturbed. However, NT label was attributed to the segments within the 6 nm limit and with null trawling pressure values, while LT segments were assigned to segments that corresponded to relatively undisturbed areas adjacent to the main fishing ground (HT). Mega-epibenthic faunal abundances (ind.100 m−1: individuals per 100 m of linear distance), composition and diversity were investigated using both uni- and multivariate data analyses performed with the software PRIMER v6 and PERMANOVA+ (Clarke and Gorley, 2006; Anderson et al., 2008). Prior to the exploration of the biological dataset in relation to trawling disturbance, the relationship between the mega-epibenthic assemblages and all acquired environmental variables [depth, sediment type (categorical predictor variable based on mud and carbonate content percentage range), avNPP, SVI, and trawling pressure] was computed by means of the distance-based linear model (DISTLM) analysis. The DISTLM routine was run using the adjusted-R2 as selection criterion and the stepwise selection procedure on normalized environmental data and the distance-based redundancy analysis (dbRDA) plot was computed to illustrate the DISTLM model (Anderson et al., 2008). In addition to trawling pressure, a strong relation between the other environmental variables and the biological dataset was observed in the DISTLM analysis. Thus, to further investigate the sole influence of trawling on the mega-epibenthic assemblages, only a subset of the dataset with relatively similar habitat characteristics was analyzed: segments characterized by muddy-sand sediments within two narrow bathymetric ranges (either 300–400 or 400–500 m) for each year. Each bathymetric range was analyzed separately, as follows: a 2-factor layout, with “Year” as fixed factor and “Trawling” as a random factor nested in “Year,” was used for the 300–400 m depth range, and a 1-factor layout, with “Trawling” as the fixed factor, was used for the 400–500 m (replicate samples from both years were not available). A Non-metric multidimensional scaling (nMDS) ordination based on the Bray-Curtis similarity matrix after 4th root transformation was performed followed by the permutational multivariate analysis of variance (PERMANOVA) to test for differences in mega-epibenthic assemblages among groups (1-factor and 2-factor nested design for the subset of data). Morphospecies contributions (%) for the observed similarity within and dissimilarity between groups were analyzed through the SIMPER analysis. Species richness (S), Shannon-Wiener diversity (H′), evenness (J) (Pielou, 1966), and Hurlbert's expected number of taxa [ET(20); Hurlbert, 1971] were used to examine diversity patterns. k-dominance (Lambshead et al., 1983) and Hurlbert's rarefaction curves were plotted to assess for differences in community structure. Lastly, non-parametric Spearman correlations were calculated between trawling pressure and mega-epibenthic faunal abundance, as well as trawling pressure and various diversity values [S, H′, and ET(20)], assuming no dependence among variables (Quinn and Keough, 2002). Significant correlation values were adjusted by using the Bonferroni correction (Shaffer, 1995), which was calculated by dividing the significance value of each test by the number of hypothesis tested. Correlation analyses were run using the software GraphPad PRISM v6 (GraphPad Software, www.graphpad.com). Overall, the distribution of the different sediment types mapped in the geological charts was confirmed by the video observations. Coarser sediments (medium and fine sands included in A6.3, surveyed in 2013) were concentrated at shallower locations (ca. 200–300 m) along the self-break/upper slope transitions and characterized by a little phytodetritus coverage. In opposition, finer sediments (A6.4 deep-sea muddy-sand) were mostly found at depths >300 m. Most segments surveyed in 2013 presented frequent ripple marks and heterogeneous patches of organic detritus material deposited on the seafloor. In 2014, most segments were deprived of evident phytodetritus coverage across all segments, which contrast with the higher annual average surface net primary production (avNPP; g.C.m−2.month−1) and smaller monthly fluctuations (lower SVI values) observed for 2014 (Table 2). Table 2. Summary of average surface Net Primary Production (avNPP; g.C.m−2.month−1) and seasonal variation index (SVI) values per dive. Segments from the flanks of the Setúbal canyon were characterized by a heterogeneous seabed microtopography, with muddy-sand sediments (A6.4) and little evidence of detrital material. A total of 27,953 individuals were counted and subsequently assigned to 71 different morphospecies, belonging to at least 50 families and eight phyla. Six pelagic species and eight benthic morphospecies present in the reduced visibility segments could not be quantified and therefore were not included in further analyses. The list of all observed taxa is provided in the Supplementary Table 1. Overall, the most abundant phylum was Annelida (66% of the total abundance), however only represented by four morphospecies. Contrastingly, the phyla Cnidaria (13%; 11 morphospecies) and Chordata (11%; 18 morphospecies) showed intermediate abundances but high taxa richness. The remaining phyla were less abundant, but not necessarily less diverse: Echinodermata (4%; 15 morphospecies), Arthropoda (3%; 11 morphospecies), Mollusca (1%; 9 morphospecies), Porifera (2%; 2 morphospecies), and Nemertea (<0.01%; 1 morphospecies). The mega-epibenthic assemblages showed a large variation within and among dives, where spatial (depth, sediment composition, trawling disturbance) and temporal (years) factors appeared to, at least partially, determine the observed variability (Figure 2). In detail, shallower areas off Sines (c.a. 200–300 m, only surveyed in 2013) yielded the highest abundances of the study, reaching 531 ind.100 m−1 at 250 m depth, and the lowest diversity, with ET(20) ranging from 3.0 to 3.4. Here, mega-epibenthic fauna was typified by high numbers of the polychaete Hyalinoecia tubicola (83–88% of the total assemblage) regardless of the sediment type (sand or muddy-sand). Figure 2. Distribution of the mega-epibenthic fauna abundance (ind.100 m−1) in relation to depth and sediment type (MdS1, medium sand; FiS1, fine sand; MS1, muddy-sand with <30% carbonate content; MS2, muddy-sand with 30–50% carbonate content; SM2, sandy-mud). 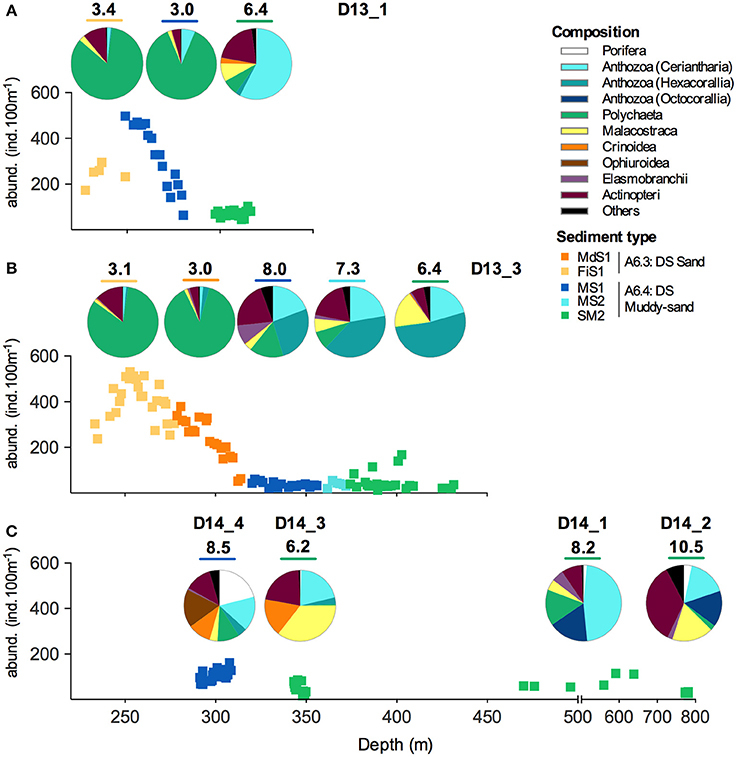 The pie charts show the taxonomic composition for each sediment type in the different dives: (A) D13_1; (B) D13_3; and (C) all 2014 dives. Hulbert's expected number of taxa [ET(20)] for each assemblage is indicated above the respective pie charts. “Others” represent all the taxa that contribute with <1% to the total abundance. Muddy-sand sediments at the upper slope off Sines (ca. 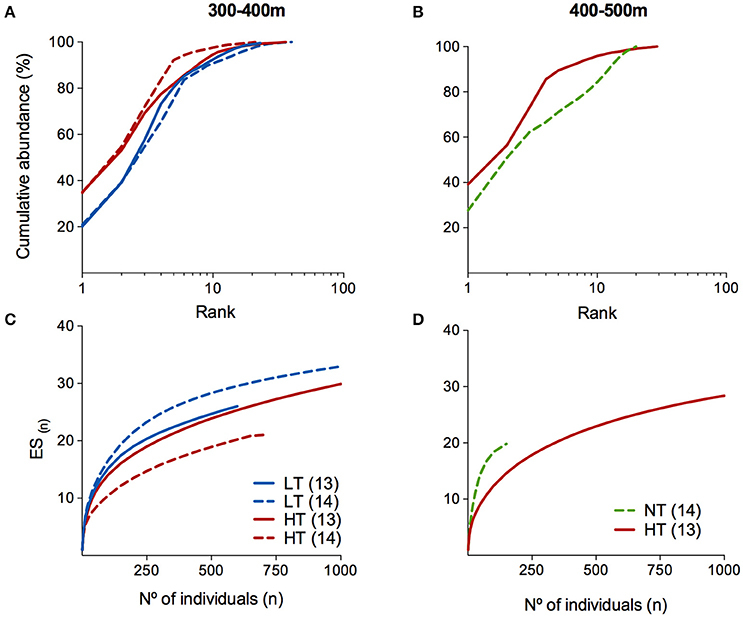 300–500 m, surveyed both in 2013 and 2014) showed much lower abundances, typically under 150 ind.100 m−1, but higher diversity, with ET(20) ranging from 6.2 to 8.5. Faunal composition gradually changed with increasing water depth. Yet, the assemblages were generally dominated by different morphospecies of tube-dwelling anemones (subclass Ceriantharia, Spirularia ind. ; 19–57%) and hexacorallian anemones (2–52%), namely epibenthic actiniarians (mostly Actinauge richardi) and zoantharians (commensal, attached to hermit crabs). Several benthic fish morphospecies (Actinopterii: 6–21%) and few crustaceans morphospecies (Malacostraca: 3–17%) were also well represented. The 2014 surveys were marked by the presence of higher abundances of Crinoidea (10–17%), but also Porifera (21%) and Ophiuroidea (18%) in D14_4. Muddy sediments at the Setúbal region (450–800 m) showed also low abundances, with 22.5 ± 3.75 and 71.8 ± 11.6 ind.100 m−1, but higher evenness leading to ET(20) values of 8.2 and 10.5 for D14_1 and D14_2, respectively. Communities were typically composed by the anthozoan subclass Ceriantharia (16–47%) and Octocorallia (15–17%), but also with relevant contributions of various other taxa such as Actinopterii (9–35%), Malacostraca (5–17%), and Polychaeta (2–15%). The DISTLM model analysis demonstrated that all six individual environmental variables were significantly correlated with the mega-epibenthic community structure (marginal tests; p < 0.01; Supplementary Table 2). The best explanatory model (adjusted R2 = 0.42852) and sequential tests recognized by order of importance, sediment type (18%), SVI (11%), depth (9%), avNPP (4%), and trawling pressure (TP; 2%), explaining a total of 44.8% of the observed variability (Supplementary Figure 1; Supplementary Table 2). Thus, because of the strong separation between the assemblages surveyed in the years 2013 and 2014, driven overall higher avNPP in 2014, but also depth, sediment type, and trawling pressure (Supplementary Figure 1), the putative effect of trawling disturbance on the mega-epibenthic assemblages was further analyzed only within segments pertaining muddy-sand sediments at two major depth ranges: 300–400 and 400–500 m (Table 3). Table 3. Characterization of the trawling scars observed in muddy-sand sediment (A6:4) segments within 300–400 and 400–500 m water depths (selected dataset). In total, 149 trawl scars were detected in the present study, mostly associated with the higher trawling pressure areas (HT; 61.1%) and muddy-sand sediments (73.8%). Undisturbed locations (NT) near the Setúbal canyon flanks were not associated with trawl marks (Table 3) and showed an overall heterogeneous microtopography and frequent evidence of faunal activity and bioturbation, numerous tracks, and variously sized burrows and mounds; which are often associated with mud-burrowing decapods, such as the Norway lobster, N. norvegicus (Figures 3A,B). In contrast, both low (LT) and highly disturbed (HT) segments were characterized by the presence of either discontinuous or continuous ripple marks. Particularly in 2013, comparatively considerable less bioturbation evidence (e.g., fewer and smaller burrows and tracks; Figures 3C–F) was observed for these areas. LT segments showed consistently low numbers of trawl scars (ca. 0.15 trawl scars.100 m−1). Most scars observed at LT segments in 2013 were classified as “recent,” while scars observed in 2014 were mostly characterized as “eroded” (Table 3). The number of scars observed in the trawling target areas (HT) was up to 19 times higher than at the LT areas (Table 3). Note that this number may be greatly underestimated owing to the repeated operation of trawlers over the same trajectories. Figure 3. Seabed image samples from the study area within muddy-sand sediments (A6.4). (A,B) Undisturbed locations at the Setúbal area (NT) showed heterogeneous topography and large faunal activity (e.g., tracks, burrows, and mounds of various sizes). Older evidence of trawling disturbance was demonstrated by the (C) chain/nets scars and (D) trawl doors marks with clear signs of bioturbation activity. Recent passages by trawlers were evidenced by (E) large door marks and (F) adjacent locations with flattened seabed surface with no recent faunal activity evidence. Photo credits: VLIZ and UGent. The nMDS plot (Figure 4) shows a segregation of the mega-epibenthic assemblages according to trawling pressure for both years. PERMANOVA results (Table 4) confirms significant differences in mega-epibenthic assemblages from different “trawling pressure” groups (p < 0.001) within the same depth range, independently of the sampling year (p = 0.3181). Morphospecies contributions for these differences analyzed through the SIMPER analysis, showed a maximum dissimilarity of 90.5% between assemblages from NT and HT segments, while dissimilarity between LT and HT segments was 64.3% (Supplementary Tables 3, 4). The comparison between NT and LT was not computed due to depth-range differences. The major contributors to the dissimilarity between NT and HT segments (400–500 m; Table 5 and Supplementary Table 4) were the dominant morphospecies in these groups: Spirularia ind. 1, Kophobelemnon sp., Galeus melastomus, and other Pennatulidae at NT segments; anthozoan anemones, such as A. richardi and the tube-dwelling Spirularia ind. 2, and high abundances of the motile predator hermit crabs with their commensal anemones (Zoantharia ind.) in HT segments. Differences between LT and HT segments (300–400 m) were largely explained by the presence of Porifera ind. 2 and Ophiuroidea ind. 1, limited to LT segments in 2014, high abundance of the predator shrimp, Plesionika sp., in HT segments, but also by various morphospecies with low individual contributions (e.g., H. tubicola, Spirularia ind. 2, Caryophyllia sp., small sized Comatulida ind. 1, and Comatulida ind. 2.; Table 5 and Supplementary Table 3). Figure 4. nMDS plot for comparison of mega-epibenthic assemblages from muddy-sand sediments segments between 300–400 and 400–500 m subjected to varying trawling pressure (selected dataset). NT, no trawling pressure; LT, low trawling pressure; HT, high trawling pressure. Closed symbols: 2013 segments; Open symbols: 2014 segments. Table 4. PERMANOVA main results based on the mega-epibenthic faunal community composition dataset of the 2-factor nested design [Year and Trawl (Year)] for muddy-sand sediments between 300 and 400 m water depths and 1-factor design (Trawl) for depths 400–500 m.
Table 5. Abundance and biodiversity results from muddy-sand sediment areas at subjected to varying trawling disturbance (selected dataset). Differences in composition between disturbed and undisturbed areas were supported by the consistently higher diversity and evenness values of the mega-epibenthic assemblages at NT [H′ = 2.33; J = 0.778; ET(20) = 9.1; K1 = 27.7], and LT [H′ = 2.25–2.38; J = 0.646–0.690; ET(20) = 8.0–8.5; K1 = 20.1–20.9], when compared to HT [H′ = 1.84–2.09, J = 0.558–0.603, ET(20) = 6.2–7.4; K1 = 34.8–39.2; Table 5]. This is further confirmed by the lower rarefaction curves and higher dominance curves displayed by the HT assemblages at both depth ranges (Figure 5). All rarefaction curves approximate asymptotic values, apart from the NT segments at the deeper areas (400–500 m, Figure 5D), indicating that the survey was insufficient to fully evaluate the biodiversity at the Setúbal sites. Figure 5. Diversity comparison among the different disturbed areas through (A,B) k-dominance curves and (C,D) rarefaction curves (Hurlbert's expected number of species) computed based on the selected dataset for mega-epibenthic assemblages at depth of 300–400 m (Left) and 400–500 m (Right) within muddy-sand sediments. NT, no trawling pressure; LT, low trawling pressure; HT, high trawling pressure. A significant negative correlation (after Bonferroni correction) was detected between trawling pressure and the estimated diversity indices: species richness (R = −0.5169, p < 0.001), Shannon–Wiener diversity (R = −0.6347, p < 0.001) and ET(20) (R = −0.6335, p < 0.001; Figures 6B–D). 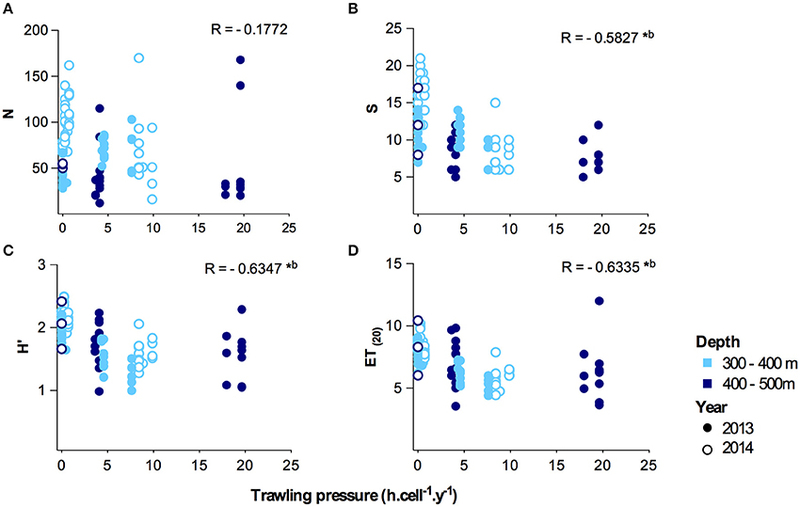 Contrastingly, no significant correlation between trawling pressure and mega-epibenthic faunal abundances was observed (Figure 6A). It is noteworthy the record of large aggregations of the hermit crab Paguroidea ind. 1 in two segments under high trawling pressure (19 h.cell.−1.y−1). The high abundances of this species largely contributed to the high variability in faunal abundances observed in the HT areas. Figure 6. Relationship between annual trawling pressure (h.cell−1.y−1) and (A) abundance (N; ind.100m−1) (B) morphospecies richness (S), (C) Shannon-Wiener diversity index (H′) and (D) ET(20) Hulbert's expected number of taxa for 20 individuals per depth range. *Indicates significant correlation; bIndicates significant correlations after Bonferroni correction. The sustainable exploitation and management of deep-sea resources can only be achieved by a good knowledge on the biodiversity and ecosystem functions of the concerned area. This has been proven difficult when, in addition to the environmental and biological processes, anthropogenic activities, particularly fisheries, are also influencing the mega-epibenthic assemblages (Ramírez-Llodra et al., 2011). This work was fundamentally driven by the limited information available on the impacts caused by crustacean bottom-trawling fisheries which have been active along the Portuguese coast since the late 70's. To our knowledge, only few in-situ observations were performed aiming to describe the mega-epibenthic faunal biodiversity there, and those were mostly concentrated in submarine canyon areas (Pattenden, 2008; Duffy et al., 2012; Fonseca et al., 2014; Gomes-Pereira et al., 2015). Yet, even less attempt has been made to identify the possible impact of fisheries on the benthic habitat and faunal assemblages (Morais et al., 2007; Fonseca et al., 2014). Hence, we discuss here mega-epibenthic faunal composition and diversity changes from areas subjected to varying trawling pressure using video and photographic methods. It is important to refer that some limitations are associated within the present study. Specifically, the low taxonomical resolution associated with identification certain taxa (e.g., Porifera and Anthozoa), may have resulted in the underestimation of the overall biodiversity in study region as we only assigned a separate morphospecies when clear morphological characters were identified. This issue is usually associated with photographic/video surveys, in areas where the understanding of biological biodiversity is still limited and is not associated with additional sampling, however it represents currently the best available tool to accurately quantify mega-epibenthic specimens (Bicknell et al., 2016). 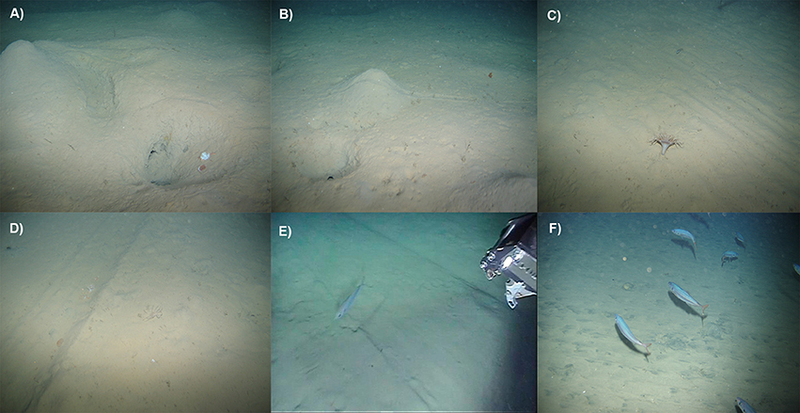 Furthermore, imagery surveys are essential to describe both faunal distribution and activity (e.g., bioturbation and feeding behavior), but also more importantly, to investigate direct evidence of physical disturbance on the seabed (e.g., presence and condition of trawl marks), otherwise impossible or counterproductive when using destructive methods such as trawl samplers (Bicknell et al., 2016). Secondly, because the laser points were not available due to technical issues, we were not able to estimate biomass differences across areas, even though the influence of bottom-trawling fisheries on this measure has been frequently reported (NRC, 2002). The effects of trawling fisheries on mega-epibenthic assemblages are fundamentally difficult to isolate from the environmental variability. Here, we observed marked differences in faunal assemblages linked with both spatial and temporal variability of the environmental and trawling disturbance conditions experienced along a relatively narrow depth range (c.a. 200–800 m). Depth-related changes in sediment sorting and fishing disturbance conditions (trawling pressure), together with the expected decrease in food supply (not directly investigated here) were accompanied by changes in mega-epibenthic fauna abundance, composition and diversity. In the area off Sines, the overall higher abundances that characterized the shelf-break assemblages (c.a. 200–300 m), regardless of the sediment type, contrasts with the sharp abundance decline at depths greater than 300 m both at Sines and Setúbal areas. An abrupt decline in the benthic standing stocks (both abundance and biomass) is usually observed with increasing water depth. These declines in standing stocks are generally linked with a major decline of particulate organic matter supply to the seafloor (Rex et al., 2006). Furthermore, the high abundance and low diversity values at shallower depths resulted from the dominance of a single species, the onuphid polychaete Hyalinoecia tubicola, present in large aggregations and often feeding on carrion. This opportunistic scavenger has been reported in several regions of the NW Atlantic, including at the Portuguese margin (Fauchald and Jumars, 1979; Ravara and Moreira, 2013). Hyalinoecia tubicola displays a wide bathymetric distribution, but is only dominant in relatively shallow and hydrodynamic areas (Grassle et al., 1975), thus it is not surprising that here shallower coarser sediment areas seemed to create a suitable habitat for this polychaete species, otherwise mainly absent at deeper locations. Furthermore, remains of dead crabs and other animals were frequently observed during the surveys off Sines. They probably originated from discarding practices which are common along the Portuguese margin (Monteiro et al., 2001), and may allow the maintenance of the abundant H. tubicola populations. The upper slope segments off Sines (>300 m) were characterized by a shift to finer sediments (but also different trawling regimes). This area showed distinct mega-epibenthic assemblages from the ones observed at the shelf-break, typified by the presence of tube-dwelling anemones and other mud-burrowing fauna (e.g., the Norway lobster). Sediment preferences by both epibenthic and infaunal organisms are often reported in other studies and have been linked to life style and feeding habits (e.g., deposit feeders may select certain grain-size classes; Levin et al., 2001; Murillo et al., 2016). The preference of burrowing organisms for finer sediment types has been related with the higher stability of this sediments. A higher sediment stability allows for example the construction of burrows and tunnels (or even large galleries in the case of the Norway lobster), which otherwise would collapse in unstable sandy sediments (Afonso-Dias, 1998). Differences in both morphospecies composition and diversity were also largely associated with different geographic locations (Setúbal and Sines areas; >300 m) and distinct long-term trawling disturbance regimes (discussed in more detail in sections Crustacean Trawling Fisheries and Seabed Physical Integrity and Mega-Epibenthic Fauna Vulnerability to Physical Disturbance). While we recognize the possible influence of canyon conditions (e.g., high energy bottom currents) at the Setúbal region (reference areas—NT), the naturally high dynamic conditions and productivity regimes of the WIM (Lavaleye et al., 2002), may attenuate the normally observed dissimilarities in community composition between canyon and slopes habitats (e.g., Ramírez-Llodra et al., 2010). In contrast with the typical dominance of deposit-feeders in other European regions (e.g., the Celtic Margin), the upper slope assemblages along the WIM tended to exhibit a naturally high proportion of sessile filter-feeders communities, often described as “canyon indicators” (Lavaleye et al., 2002). These “canyon indicators” were represented here by several morphospecies of the sub-class Octocorallia. The presence of current ripple marks parallel to the isobaths lines confirms the high energy hydrodynamic conditions along the self-break and upper slope off Sines. Besides spatial variability, the mega-epibenthic assemblages also showed differences between years. As stressed before, these temporal changes must be interpreted with caution because of the differences in the alignment of the dives (perpendicular or parallel to the coastline) and of sediment types and depths surveyed in 2013 and 2014. Temporal fluctuations in environmental conditions, namely the lower seasonal fluctuations and higher surface productivity in 2014 may explain the observed increase in dominance of detritivores (e.g., ophiuroids). The influence of other stressors that we were not able to directly investigate here (e.g., water masses properties, bottom currents, etc. ), likely also contributed to these interannual differences. It is also important to mention that extreme storms occurred during the winter of 2013–2014 (Instituto Português do Mar e da Atmosfera, 2014), and those were not recorded in the winter of 2012–2013. These extreme events resulted in severe beach erosion and transport of large amounts of OM rich sediments from terrestrial origins toward deeper areas (Sanchez-Vidal et al., 2012; Diogo et al., 2014), likely providing additional food sources for detritivores and deposit feeders in the surveyed area. The initial characterization made by the Portuguese government—Direcção Geral dos Recursos Naturais, Segurança e Serviços Marítimos (DGRM) (MAMAOT, 2012) in the context of the European Union's Marine Strategy Framework Directive highlights trawling fisheries as one of the most pervasive activities along the Portuguese margin. Furthermore, the Portuguese government has issued a ban for bottom-trawling activities in the high seas areas comprising the Azorean EEZ and the claimed extended continental shelf beyond the 200 nautical miles2. However, these interdictions do not include continental slope and submarine canyon areas along the Portuguese mainland, which are the principal target habitats of deep-water crustacean trawlers. Fishing effort distribution patterns in the mainland differ greatly between northern and southern regions (north and south of Cape Espichel, respectively). These differences are primarily related to the distribution of different target species and their preferred habitats. In the north, the most landed species include several cephalopod and demersal fish species that occur in coarse sediments along the continental shelf; in the south region, the most valuable species include several deep-water crustacean species (e.g., the Norway lobster, red and rose shrimps), which typically occur at muddy and muddy-sand habitats between the shelf break and 700 m water depths (Campos et al., 2007; Bueno-Pardo et al., 2017). Our results show the highest evidence of disturbance (trawl scars) in muddy-sand sediment bottoms (300–500 m depth) and an increase of up to 5 times in the observed number of trawl scars from 2013 to 2014, which are consistent with the fishing effort distribution and the increase in trawling pressure off Sines reported by Bueno-Pardo et al. (2017). This recently observed shift in trawling activity toward the Southwest region, mostly toward deeper locations (Bueno-Pardo et al., 2017), is of particular concern because it is likely to exert an unprecedented pressure on the deep-dwelling benthic assemblages and should be followed by an adequate monitoring programme. While the most direct evidence of trawling pressure on benthic habitats are illustrated by the trawl scars, other seabed features could also help to characterize the effect of trawling in this area. Both the direct evidence of trawl fisheries impact (number and condition of the trawl scars), as well as the microtopography and bioturbation evidence (as proxy of the “ecosystem engineers” faunal activity) could help to infer the physical integrity of the seafloor; which is crucial for benthic biodiversity and ecosystem functioning (Rice et al., 2012; Thurber et al., 2014). The studied areas included in this research suggest that seabed integrity was largely compromised at disturbed locations off Sines. In the most severe cases (several HT segments) the seabed showed a completely flat appearance, and overall both HT and LT areas displayed low structural complexity. These observations contrasted with the area off Setúbal, which has never been trawled, and where the presence of a complex microtopography, represented by numerous tracks from crawling fauna, variously sized burrows and mounds was observed. These mentioned seafloor characteristics are indicative of the presence of “ecosystem engineering” fauna, responsible for performing several fundamental functions in the environment, such as promoting sediment carbon cycling, enhancement of water-sediment flux microhabitat provision and refuge for associate fauna (Thurber et al., 2014). Among the most evident impacts associated with the low selectivity of bottom-trawling practices are the direct removal of large biomasses of target species, incidental catches of non-target species (by-catch), and overall increased in-situ mortality of damaged individuals. The indirect effects on the benthic habitats may include compromised seabed integrity (mentioned above), changes in benthic community trophic structure and size spectrum, and decreased mega-epibenthic fauna diversity (Jennings and Kaiser, 1998; NRC, 2002). However, the results of different studies are often inconsistent. For example, Atkinson et al. (2011) reported a decline in both mega-epibenthic faunal abundance and species richness from low to highly disturbed areas (reference conditions not available). In the Barents Sea, Buhl-Mortensen et al. (2015) investigated a wide range of soft and hard-substrate bottoms, and they have observed significant declines in abundance in sand and hard substrates locations, while muddy bottoms showed no distinct patterns regarding changes in abundance. In the south Portuguese margin, Morais et al. (2007) and Fonseca et al. (2014) identified a depletion of mega-epibenthic organisms abundances and diversity in fine sediment locations that suffered intense exploitation by crustacean trawlers with little evidence of recovery, while rocky and coarse sand substrates (avoided by trawlers to not damage the nets), promoted refuge for several sensitive species that included a large crinoid bed of Leptometra celtica (Fonseca et al., 2014). Moreover, most studies on soft sediment faunal assemblages impacted by trawling are flawed by the lack of reference pristine areas of the same habitat type. By comparing mega-epibenthic assemblages subjected to different levels of trawling pressures only in areas with similar sediment types and depth ranges, our study attempts to minimize the effects of other confounding environmental variables. Overall, the mega-epibenthic assemblages under higher levels of trawling pressure showed low diversity (taxa richness and evenness) in agreement with previous reports form the Southern Portugal coast (Morais et al., 2007; Fonseca et al., 2014). 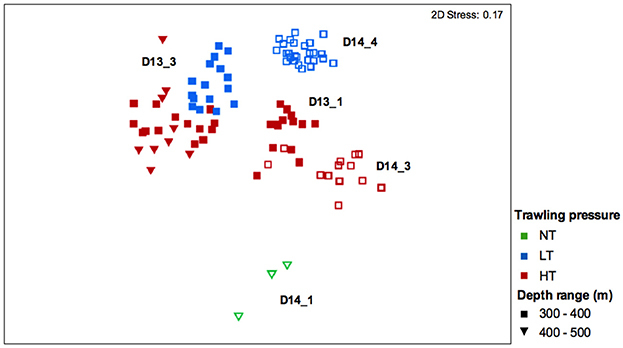 Differences in community composition were mostly marked between undisturbed locations (NT) and highly impacted sites (HT). Undisturbed areas were characterized by a more diverse fauna, showing a wider range of feeding modes and life styles. Among the most dominant taxa here were small tube-dwelling Spirularia ind. 1, several filter-feeding seapen species (e.g., Kophobelemnon sp., Pennatula sp.) anchored to the seabed and small predatory sharks (G. melastomus). In contrast, the typical dominant fauna of impacted areas included large and robust anemone species (A. richardi and tube-dwelling Spirularia ind. 2) and several highly mobile fish species and decapods with an opportunistic feeding behavior (predatory-scavenging; e.g., the arrow shrimp—Plesionika sp. and the hermit crabs—Paguroidea ind. 1). The presence of abundant motile predators or scavengers in HT segments is consistent with previous observations reporting a rapid response after disturbance of such species (e.g., Dannheim et al., 2014; Almeida et al., 2017) but also experimental works performed in the deep sea (Bluhm, 2001; Gerdes et al., 2008). In fact, there is often an increased food availability for these trophic groups in recurrently trawled areas, which results from both the on-site mortality or injured fauna, but also from discarding practices (Ramsay et al., 1996; NRC, 2002; Castro et al., 2005). The low commercial value of many by-catch species (e.g., Henslow's crab) at the WIM often leads to discarding of an average of 40–70% of the fished biomass by crustacean trawlers (Borges et al., 2001; Monteiro et al., 2001). Differences between LT and HT mega-epibenthic assemblages were less pronounced than between NT and HT. Because LT areas are adjacent to the main fishing grounds (HT areas), they are likely influenced by trawling-induced turbidity. Pervasive high turbidity owing to sediment re-suspension during trawling operations (Puig et al., 2012; Martín et al., 2014) causes smothering of filter feeding fauna and can lead to overall lower abundances (Greathead et al., 2007). Lastly, the lower dissimilarity between HT and LT assemblages off Sines (64%) when compared to NT vs. HT areas (91%), suggests that the long-term influence of physical disturbance led to a significantly altered state of the mega-epibenthic assemblages in areas beyond the ones directly targeted by crustacean trawlers. This work showed relevant differences in mega-epibenthic assemblages, linked both with environmental heterogeneity in the study region and trawling disturbance. The marked differences in morphospecies community composition and lower diversity in the disturbed locations, as well evidence of deleterious effects in areas beyond the ones directly targeted by crustacean trawlers, are indicative of strong effects of bottom-trawling activities on the mega-epibenthic assemblages off the SW Portuguese margin. Future recovery assessments would require historical analysis on both trawling pressure and community-based information (not currently available to our knowledge). Nevertheless, the observed deleterious effects of trawling on mega-epibenthic fauna, together with the intensification of trawling pressure in the study area stress the need for adequate monitoring programs and regulatory measures to halt the long-term loss of biodiversity and allow the sustainability of fisheries at the SW Portuguese Margin. Lastly, it is important to point that trawl disturbance evidence on the seabed, assessed through the number and condition of the trawl scars, supports the Vessel Monitoring Systems (VMS) mapping and trawling pressure estimates performed by Bueno-Pardo et al. (2017), for the Portuguese Margin. While this method shows constraints related with data acquisition and background information of benthic habitat biodiversity, VMS data shows great potential for the identification of areas of interest in the deep sea that may need further monitoring. MC, AV, and NL generated the study idea and funding. MC, AV, SR, and LL were responsible for the ROV video data acquisition, further analyzed by SR, EC, and JA. JB-P processed VMS data used to obtain trawling pressure estimates. SR wrote the manuscript with significant contribution from all authors. The authors thank all scientific parties, the captain, the crew, as well the ROV Genesis team of VLIZ for their excellent logistical support during the RV Belgica 2013/17 and RV Pelagia 64PE387 cruises. We are also grateful to Rui P. Vieira for his help with the identification of fish species. This work was supported by CESAM (UID/AMB/50017) funds, granted by FCT/MEC through national funds, and co-funded by FEDER, within the PT2020 Partnership Agreement and Compete 2020. SR work was (co-) funded through a MARES Grant. MARES is a Joint Doctorate programme selected under Erasmus Mundus coordinated by Ghent University (FPA 2011-0016). Check www.mares-eu.org for extra information. LL work was founded by BOF (12/DOS/006) and CAPES (BEX 11595/13-2) grants. JB-P was funded by the Calouste Gulbenkian Foundation, through the project “The Economic Valuation and Governance of Marine and Coastal Ecosystem Services” (MCES) (BPD/UI88/6454/2014). 1. ^Diário da Républica, Decreto regulamentar n° 43/87 de 17 de Julho, Ministério da Agricultura, Pescas e Alimentação, 1ª Série - n°162 de 17 de Julho de 1987. 2. ^Diário da Républica, Portaria n° 114/2014 de 28 de Maio, 1ª série n°102 de 28 de Maio de 2014. Afonso-Dias, M. (1998). Variability of Nephrops norvegicus (L.) Populations in Scottish Waters in Relation to the Sediment Characteristics of the Seabed. Ph.D. thesis, University of Aberdeen. Anderson, M. J., Gorley, R. N., and Clarke, R. K. (2008). Permanova+ for Primer: Guide to Software and Statistical Methods. Plymouth: PRIMER-E Ltd. Plymouth. Clarke, K. R., and Gorley, R. N. (2006). PRIMER Version 6: User Manual/Tutorial. Plymouth: PRIMER-E Ltd. Plymouth. Davies, C. E. C., Moss, D., and Hill, M. O. (2004). EUNIS Habitat Classification Revised 2004. Paris: European Topic Centre on Nature Protection and Biodiversity. Diogo, Z., Bastos, A., Lira, C., Taborda, R., Andrade, C., Silveira, T. M., et al. (2014). Morphological impacts of Christina storm on the beaches of the central western Portuguese coast. Comunic. Geol. 101, 445–1448. European Commission (2016). European Marine Observation and Data Network Portal (EMODnet). Available online at: http://www.emodnet.eu (Accessed on April 10, 2016). Fauchald, K., and Jumars, P. A. (1979). 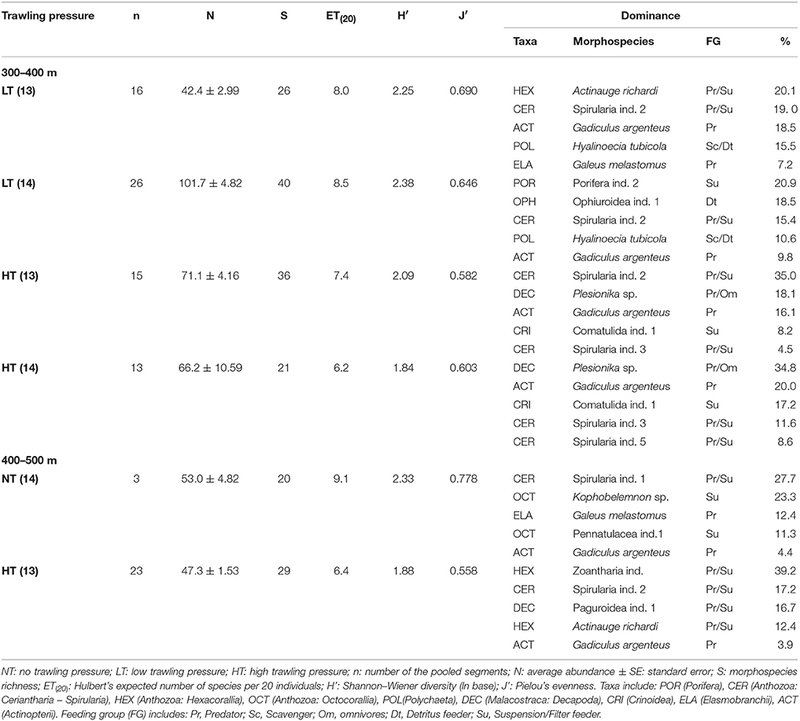 The diet of worms: a study of polychaete feeding guilds. Oceanogr. Mar. Biol. Ann. Rev. 17, 193–284. Fiúza, A. F. G. (1983). “Upwelling patterns off portugal,” in Coastal Upwelling Its Sediment Record, Coastal Upwelling Its Sediment Record: Part a: Responses of the Sedimentary Regime to Present Coastal Upwelling (Boston, MA: Springer), 85–98. Gomes-Pereira, J. N., Tojeira, I., Ribeiro, L. P., Santos, R. S., Dias, F., and Teixeira, F. (2015). “First in situ observations of soft bottom megafauna from the Cascais Canyon head,” in Arquipelago - Life and Marine Sciences, GraphPad Software (La Jolla, CA) Available online at: www.graphpad.com (Accessed on May, 01, 2016), 67–74. Instituto Hidrográfico. (2005a). Carta dos Sedimentos Superficiais da Plataforma Continental Portuguesa - Folha 5 - Escala 1:150 000. Instituto Hidrográfico. (2005b). Carta dos Sedimentos Superficiais da Plataforma Continental Portuguesa - Folha 6A - Escala 1:150 000. Instituto Português do Mar e da Atmosfera (2014). Informação mais Detalhada Sobre a Tempestade Stephanie. Available online at: https://www.ipma.pt/pt/media/noticias/news.detail.jsp?f=/pt/media/noticias/arquivo/2014/tempestade-stephanie.html (Accessed on 01, November, 2016). Leys, S. (2013). Effects of Sediment on Glass Sponges (Porifera, Hexactinellida) and Projected Effects on Glass Sponge Reefs. DFO Canadian Science Advisory Secretariat Research Document 2013/074, 1–23. MAMAOT (2012). Estratégia Marinha Para a Subdivisão do Continente. Diretiva Quadro Estratégia Marinha. Lisboa: Ministério da Agricultura, do Mar, do Ambiente e do Ordenamento do Território. National Research Council (NRC) (2002). Effects of Trawling and Dredging on Sea-floor Habitat. Washington, DC: The National Academies Press. Pattenden, A. D. C. (2008). The Influence of Submarine Canyons on the Structure and Dynamics of Megafaunal Communities. Ph.D. thesis, University of Southampton. Quinn, G. P., and Keough, M. J. (2002). Experimental Design and Data Analysis for Biologists. Cambridge: Cambridge University Press. WoRMS Editorial Board (2016). World Register of Marine Species. Available online at: http://www.marinespecies.org (Accessed May 01, 2016). Copyright © 2017 Ramalho, Lins, Bueno-Pardo, Cordova, Amisi, Lampadariou, Vanreusel and Cunha. This is an open-access article distributed under the terms of the Creative Commons Attribution License (CC BY). The use, distribution or reproduction in other forums is permitted, provided the original author(s) or licensor are credited and that the original publication in this journal is cited, in accordance with accepted academic practice. No use, distribution or reproduction is permitted which does not comply with these terms.